*Even though it can be easy to rip into the PC port of the game, I cannot give a clear judgement of the gameplay as I have never played this version. Therefore, obviously, this critique will be absent from the overall score. Slinking and swooping over and in between buildings, smashing foes from above and scavenging for crucial clues; Rocksteady nailed the essence of being the Dark Knight in both the 2009 game, Batman Arkham Asylum and its 2011 sequel, Batman Arkham City. It took what people loved about Batman: the lore, the characters and the voices, and stuffed it everywhere you looked. Returning for the final chapter in their trilogy, Batman is faced by a new and powerful foe who is intent in seeking revenge for reasons rooted in the past. 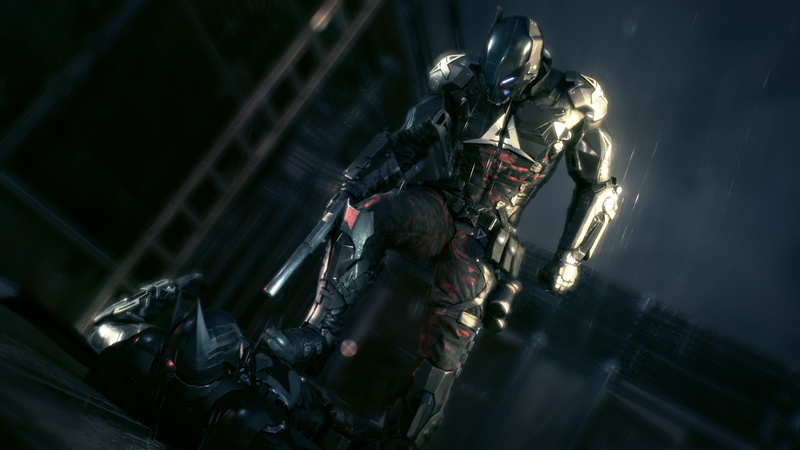 Batman Arkham Knight is, for the most part, a solid if not imperfect ending to the series with a much bigger sandbox to explore, a handy collection of new combat additions and the ability to team up with a partner, adding to the stellar foundation that was created in the previous two games. For the first time in its history – and about time too! – Gotham is brought to life in its bleak and gloomy glory. Fully realised with craggy gothic buildings, flickering LED billboards and cascading rain whipping and soaking Batman’s cloak, fans are treated to a pretty authentic realisation of the city that raised the caped crusader. Rocksteady have breathed life and character into the city: with NPCs scuttling about in beat-down cars, delapidated walls plastered with pop culture collages and with next-gen-fuelled riots cramming the roads everywhere we turn. The main antagonist in the game, the Dark Knight. The previous two games created this claustraphobic tone by boxing you in narrow corridors and dimly lit rooms; in the first game especially, you felt like Batman was really in the madhouse, so this third game adds a nice change of pacing but largely sticks to the themes of the previous games. Batman’s ability to swoop from roof to roof has been vastly improved, with the ability to chain grapples from building to building, making climbing skyscrapers a less tedious task. As a player, you feel a sense of ownership of the city that didn’t exist previously in the two games, a duty that wasn’t a force of hand when shut into a closed space. 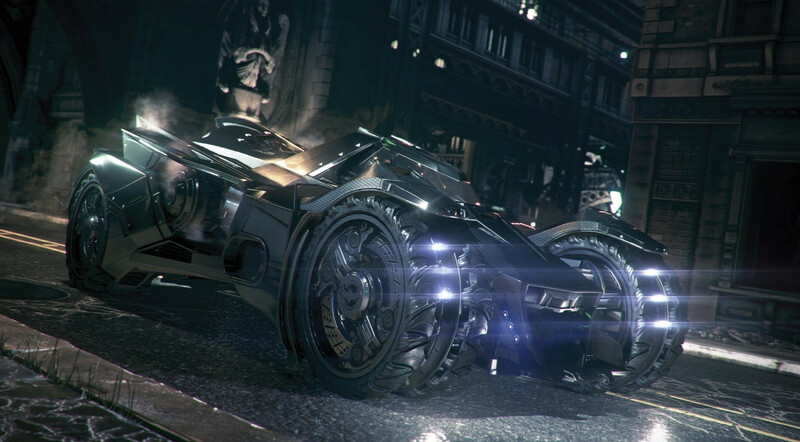 Problems build when we get to the ground, however, as Arkham Knight has a batmobile-sized hole in its game. The introduction of Batman’s, perhaps, biggest and most important gadget is somewhat problematic as this reviewer must battle with his innerchild squealing at the chance of driving the vehicle that propelled Michael Keaton, Christian Bale & Co through the night, and the pragmatic person who knows that it doesn’t quite fit in the gameplay. The iconic batmobile plays a huge part in Rocksteady’s final outing in the series. The batmobile isn’t the fastest or the most efficient way of getting around the twisting roads and tunnels of Gotham, nor does the combat thematically fit within the lore or match up with the drone tanks they send that act as moving targets. It feels somewhat odd having to blow up tanks with 60mm turrets but fully abstain from the use of guns whilst on foot – it feels like a cop-out by saying one rule can be ignored on one instance but not the other. The tanks that B-man faces act as barely a challenge with an almost one shot kill resulting in danger swelling only when they hunt in packs. As a souped up tank with nitroengines, it feels too loose and arcadey at full pelt for the driving to feel satifying in the seemingly narrow roads but this is almost counterbalanced by the “Oh God, I’m Batman” empowerment it gives you behind the wheel. Overall, the driving wouldn’t be a bad addition if the Batmobile was just a method of travel, but unfortunately, it isn’t. It seems that to justify the Batmobile’s inclusion, is akin to including the Batmobile in as many missions as possible, be it ill-fitting or otherwise. There are these stapled on moments for example, that force you to navigate the Batmobile to a vantagepoint just so that it can get to a special ledge to press a button. From a technical aspect, the game looks amazing on the Xbox One with it delivering almost perfectly at the specs specified on the back. On one occasion however, after a death, I managed to find a game-breaking glitch where Batman would continue to fall through the map and this admittedly brought frustration as I had to quit the game to fix the issue. Alongside the fairly long campaign missions, there is plenty to do as an alternative. The Riddles that tormented Batman in the previous games have been brought back and supplemented by even beefier challenges – some frustrating, like the racing, and some more cerebrally challenging missions later on that I dare not spoil – with the addition of seeing Edward Nygma in the flesh as he jeapordizes the life of one of your companions. One of the side missions involving investigating dead bodies hung from buildings harked an ominous, dark tone that I enjoyed, contrasting with the bank heist missions tasking you with beating up a set amount of villians before they steal the loot, forcing you to swoop around at a mad-cap pace compared to the measured, average affairs. Moving on to the combat. Rocksteady have kept the meat of the fighting largely intact – punches thud with satisfying velocity and it feels like a challenge to keep the chains going with a precisely placed evade, counter and stun, mixing up superhuman leaps from foe to foe. While the combat does make you feel powerful, it can be hard to avoid buttonmashing though. The inclusion of enviromental attacks such as a grapple into an electricity box does feel great to nail properly in a densely packed room but it does slightly break that suspension of belief that we aren’t killing them in the clustered fracas. New enemies add variety to the mix, with heavy brutes forcing you to spare them till the end and in the case of the new medics, doing the exact opposite in fear of them fixing the damage you left on their mate’s now unconscious temple. The predator mode has also been left unscathed as well but enemies quickly adapt to any tactic spamming; if you are dumb enough to constantly sneak up on them, they double up back to back and if you slink in and out of the grates, they put a fire bomb in to flush you out. It really forces you to think about what you are doing which I feel is a nice use of the engine. Batman Arkham Knight is not a perfect game, but it often nails what makes it so great that it can be frustrating when it slips. As the final part of the series, it captures the signatures of Batman and puts the boat at bits when most would try to phone in and accept their paycheck. A solid game for any Batman fan.